Don’t put that water bottle in the trash, make some art out of it! Our “throw-away” society has run rampant with our consumption of one-use disposable items. In 2015, we produced globally 381 MILLION metric tonnes of Plastic and managed to recycle only 20%! At Arthaus Projects, we think it’s time to step up and inspire people to creatively repurpose old materials! 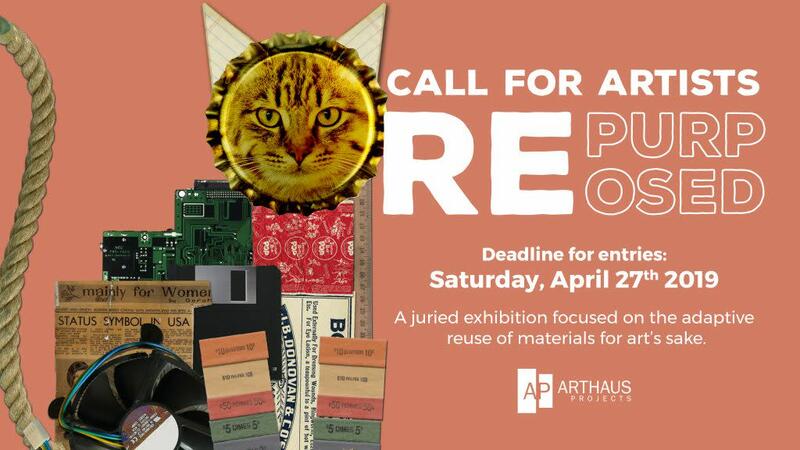 Arthaus Projects, a community oriented non-profit art space located in downtown Williamsport, is excited announce the theme for their fourth annual juried exhibition “Repurposed.” “Repurposed” is a juried exhibition focused on the adaptive reuse of materials to create new art. Participating artists are asked to create an original piece of artwork that utilizes some sort of found object, or unusual recycled medium as the base for the piece. Examples include (but are not limited to) books, windows, or any use of non traditional materials in the creation of a piece. The goal should be to create something beautiful out of materials that might have wound up in the landfill. This is a juried visual art competition and exhibition that is open to two-dimensional, three-dimensional, and digital artists working in any medium except performance art. There is no age restriction (under 18 year old applicants will need a parent or guardian’s consent and signature on the back of the entry form to apply). Work may not exceed the size of 35″ wide x 82″ high unless it can be broken down and re-assembled within the gallery. All entries that are not selected for the exhibition will be displayed as part of an online exhibition on the Arthaus Projects website.